2014 was the 2ndwarmest year since 1998 for South Okanagan. July and October temperatures were way above last year but September was lower than the last 3 vintages, hence pushing for better phenolic ripeness was not at risk of gaining high alcohol. The tonnage we got was lower than the tonnage expected mostly because of thicker skins and smaller berries. The wines are concentrated, with a very good ripe tannic structure. 2014 marks only the second ever release of Arioso (a melodic solo performance). 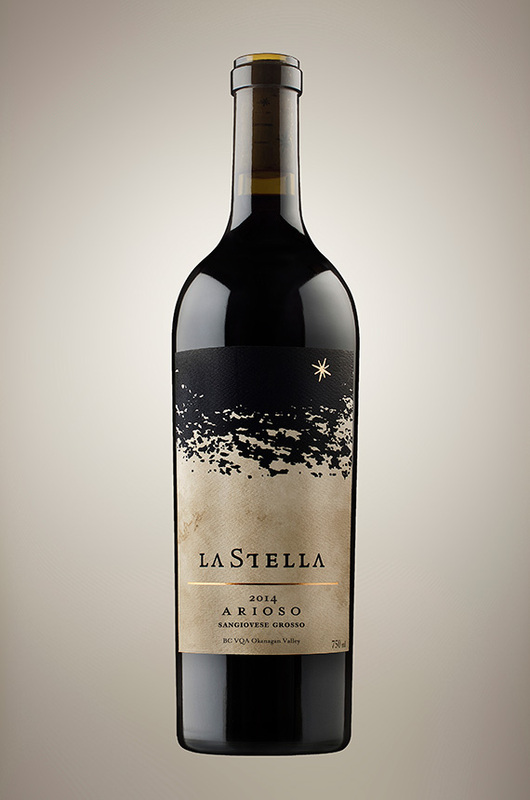 Arioso is a wine comprised of 100% Sangiovese Grosso (aka Brunello clone). A light coloured red that is medium bodied, chiseled, elegant and confident. Arioso excites the senses and reminds the beholder why Sangiovese is considered one of the most noble of all grape varieties. Notes of bing and red cherries greet you on the nose followed by rawhide leather, potpourri and wild desert flowers. On the palate the wine is linear with outstanding tension of natural acidity and rustic tannins that demand food or extended cellar time to soften. Try a bottle on or shortly after release to satisfy your curiosity and then let the remainder of your bottles tucked away in the deep, dark, cold part of your cellar for half a decade plus. Tuscan wild boar stew or rabbit ragu over polenta are two of our favorite pairings. I had the privilege of tasting their LaStella Arioso Sangiovese Grosso 2014 which is a wine club exclusive and, uh, it makes one damned tempted to join their wine club. Pitch-perfect Tuscan notes of violets, currants, fresh herbs, and earthy character mingle with hallmark Okanagan ripeness, acidity, and minerality. Sangiovese is a difficult enough grape in Tuscany, and even more difficult in terroirs beyond. There is at a bit growing in the south Okanagan of B.C., which sits a more northerly latitude than Tuscany but makes up with a hot growing season. This has a nose very similar to good Chianti or Brunello with lifted red currant, sun dried tomato, rosemary/sage, vanillin and spice. It is medium-full bodied, nicely balanced, warming, drying yet delicious, with fresh acidity. The focus and length are excellent. Very impressive and ready enough to drink with your next Italian meal. But it should also age well through the mid 2020s.